The lighthouse is a white timber building. 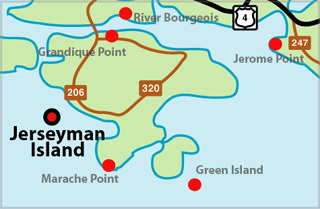 Jerseyman Island is a crescent-shaped strip of land sitting athwart the entrance to Arichat Harbour. The island was named by members of the Robin family who migrated to Isle Madame some two hundred or more years ago from the island of Jersey to establish a fish processing plant. Extending in a NW/SE direction, it consists of three hump-like mounds of scrubby land connected by two rough, stone beaches. Approaching from seaward, the island forms part of the northern coastline of Chedabucto Bay at the entrance to the Strait of Canso - starboard hand all the way. The island is densely covered with stunted spruce and alder bushes. The seaward side is ringed with constantly breaking seas and fringed with treacherous reefs, ledges and shoals. My family's days on Jerseyman Island, together with the lighthouse dwelling, part of a vanishing era, have long passed. Yet the unimposing, unattended white tower still stands on Beach Point. More alone than ever its fixed red lens still welcomes mariners to the harbour entrance, still beckoning "come in, this way please". In 1950 the lighthouse was replaced by the present tower and a new keeper's house. The light was automated and de-staffed in 1978. 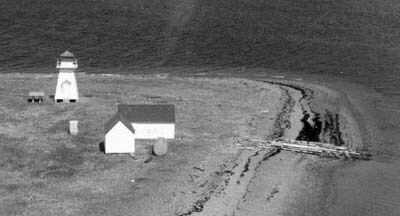 The keeper's house was removed from the island in 1980. It was springtime in the year 1930 when as a boy of ten years I was introduced to the rigors of isolation and life at a lighthouse on a remote one-family island; at a time when at school I would attain the new and inspiring title: the lightkeeper's son at Jerseyman Island. On that first of April morning in 1930, Arichat Harbour was peaceful; a gentle breeze wafted across the harbour with hardly a ripple on the water. In a large borrowed boat with several helping hands we set sail for our new home. A few seagulls hovered as we landed on Jerseyman Island and walked up the sloping beach to the lighthouse. Adjacent to the lightstation was a slipway on which was mounted an ancient windlass fitted with a crank and a length of frayed, rusted cable. Perched on a rotted wooden stand was an "over the hill" hand operated fog horn that could well have been rated as a piece of high tech apparatus left over from the Ark. And sitting in its chocks was the grand daddy of immobility- a battered, derelict dory that was equipped with a pair of worn, bent oars. Fortunately some compassionate soul had remembered to leave the plug and dustpan-type bailer in the dory. At the lighthouse, what we saw was what we got - a couple of worthless fixed assets combined with a dwelling, an outdoor two-holer called "dunkin'", a boathouse, and an oil/coal storage shed to which was attached a lean-to. Blistered paint and a general state of disrepair and neglect abounded. Indeed, it was not an idyllic setting in which to begin a new life. Nonetheless, as father's appointment as lightkeeper was confirmed by the Department of Marine and Fisheries (DMF), words were inadequate to describe the elation and the outburst of eagerness and appreciation at having secured a job that would present a monthly income and an opportunity to provide for the family. Father had been wounded in the mud and blood of Flanders at the Battle of Vimy Ridge in 1917. Now, in 1930, he was one of a handful of WWI veterans to be awarded a government posting; a position that rated a monthly income of $68, a princely sum at a time when Canadians struggled with economic depression. To describe Jerseyman Island lighthouse would be to generalize on the standard design of the era, when the keeper and his family lived in an attached dwelling, as opposed to the abundance of inner harbour stations that were attended by nearby residents. The duties of a lightkeeper were various and required constant vigilance. In addition to routine duties, keepers kept an eye on the shoreline for beached or floating objects, and monitored lights within visual range for continuity and brightness. Our first entry into the dwelling, attached to the south side of the tower, revealed a hardly habitable shack. Rough, bare wooden floors, windows with cracked panes and frames sealed with multi-coats of paint and wall paper that hung loosely from the slanted walls greeted us, while steep, narrow ladder like stairs serviced the four storey lantern tower. By summer's end though we had made at least a small impression toward transforming a house into a home. Through the marvel of Eaton's catalogue and their Home Lover's Club mother was able to procure necessities like floor linoleum, curtains, bedding, blankets and winter clothing. But, in the beginning, the only practical feature I remember seeing in the lighthouse dwelling was a hand operated water pump that drew rain water from a cistern that was located in the basement. There was no electricity, telephone, plumbing or radio and neither was there a procedure in place for signalling an emergency communication to the mainland. One storey below the lantern was the lightroom, where daily servicing was done, including fuel replenishment, wick trimming, cleaning and polishing. Records were kept of times of lighting and extinguishing the light, times of sunrise and sunset, temperature and barometric readings, wind direction and force, state of sea and sky as well as notations of any unusual or important observations. It was during the first winter that the real facts of life became evident as we huddled around the kitchen stove each evening while endless gales drove horizontal blizzards across Chedabucto Bay; shrieking gales that funnelled into Crid Pass as we discovered the heat-keeping aspect of our island home was much like that of a woven basket. There was no need for air conditioning. But before the winter, as that first spring season advanced into warm, pleasant summer, when family, relatives and friends would visit, happiness prevailed while we fashioned our own lifestyle- the joy of outdoor picnics, building castles on the nearby sand beach and exploring the newness of the shoreline during a time when children created their own entertainment. Father taught us the art of splitting, salting and drying codfish and building wooden lobster traps. We did considerable sailing under a sprit-rig and sails that mother stitched from used flour bags. Loneliness and boredom were also obviated by an endless routine of daily chores which required attention in order to eke out a mere existence. And at the end of a long, tiring day, if one felt inclined to indulge in leisurely amusement, there was always the yellow glow of the kerosene lamp at hand and reading material like Simpson's catalogue, the Family Herald and Belcher's Almanac. All was well read material before its final consignment for further use in the outdoor "dunkin". On regular occasions father and I would row to the mainland and walk two miles to the nearest general store, where we would gather provisions. In those day, provisions consisted of beef by the quarter, pork by the side or barrel, flour in 100 pound bags, barrels of salted herring, mackerel and a supply of dried codfish. There were certain days in winter that father was able to make a crossing, either by walking on risky-thin ice or manhandling the boat through the drifting pack ice. Movement of provisions was by means of a large hand drawn sled. On such occasions, our larder would be supplemented with fresh food and the ever-welcome mail, received, read and re-read. We adored the Postmaster. The abiding wisdom and generosity of the DMF decreed that since this was an island station, the dory should remain on site, listed in inventory as "mobile equipment". With father's prompt carpentry repairs, caulking and painting completed, this asset eventually slid down the ways, newly christened "DMF Yacht". During the winter of 1931 my father mastered the art of wooden boat building in the cold boathouse. By spring, he had fashioned a seaworthy 16 footer that we named Sea Breeze. It was this sturdy little ship that my sister and I rowed across the one mile strip of exposed water and walked two miles to attend school. Meanwhile, there were many days due to inclement weather that we could not make the crossing. Mother would patiently teach us the three R's and in winter was our full time teacher. In later years I came to realize that my Alma Mater was in fact, a lighthouse. Along with my mother's many other tasks and responsibilities were chores like laundry, which was done by hand in a round galvanized steel tub on which was mounted a hand operated wringer. The washing commenced only after water had been pumped from the cistern and heated on the stove-top, providing that the hand pump supply didn't run dry. In this event, it was a matter of praying for rain, lots of it, or transporting water in "that dory". Weekend baths were negotiated in the same galvanized tub. Summer brought its own delights, including the arrival of visiting yachts that would anchor in the quiet cove adjacent to the lighthouse. We admired their smooth, sparking hulls and pondered on the apparent affluence of the people on board. Still more exciting were the regular visits of the fast patrol boat Whirl, whose eagle-eyed skipper would ask the routine question: "Have you seen the Reo II or the Josephine K", two well known rum runners that plied between St. Pierre and Nova Scotia. Excitement abounded during the month of August 1931 and each summer thereafter with the arrival of the CGS Lady Laurier, the DMF supply ship. Our one year supply of landed inventory consisted of three drums of kerosene, a broom, mop, large bundle of cleaning rags, cans of Bon Ton brass polish, a stick of jeweller's rouge, six bars of Surprise soap, a few gallons of paint, paint brushes, lamp chimneys, wicks, matches and a log book. Quickly, the delivery slip was signed and with a cheery "see you next year", the busy men departed. The visiting inspector expressed delight at the gleaming brass in the lantern and the general state of tidiness of the station. Officialdom seemed to have a thing about polished brass - hence the abundance of Bon Ton and rags. The all important Fresnel lens, prisms and reflectors were maintained with jeweller's rouge and a soft chamois. Beginning in 1939, with the advent of World War II, an added responsibility was handed to lightkeepers by way of an alert that governed the operation of lighthouses. CBC Radio routinely aired instructions under the code names "Apple, Butter" and "Charlie" that contained a secret message advising that keepers should either exhibit or extinguish their lights at certain times. The "A, B, C" message was indeed a well kept secret, known only by the lightkeeper. Soon, I would leave my island home and go to sea in a British cable ship based in Halifax. Later, while studying marine radio communications, I would operate a delivery boat that serviced the early convoy assemblies in Bedford Basin. So, my first two mile sea voyage to my island home in 1930 would be followed in war and peace by additional thousands of miles of sea travel to major seaports of the world, as I served as a radio officer in Canada's Merchant Navy. Today, as we stand on the threshold of a new century we think of the lighthouse and its services as the subject of a vanishing era, an era that has already witnessed the elimination of lightkeepers. The final chapter may well be total obsolescence with the removal of the lighted towers themselves, extinguished forever; a return to a darkened coast in favour of new technology like Satnav and new services offered within the Inmarsat system. Tower Height: 028ft feet high.